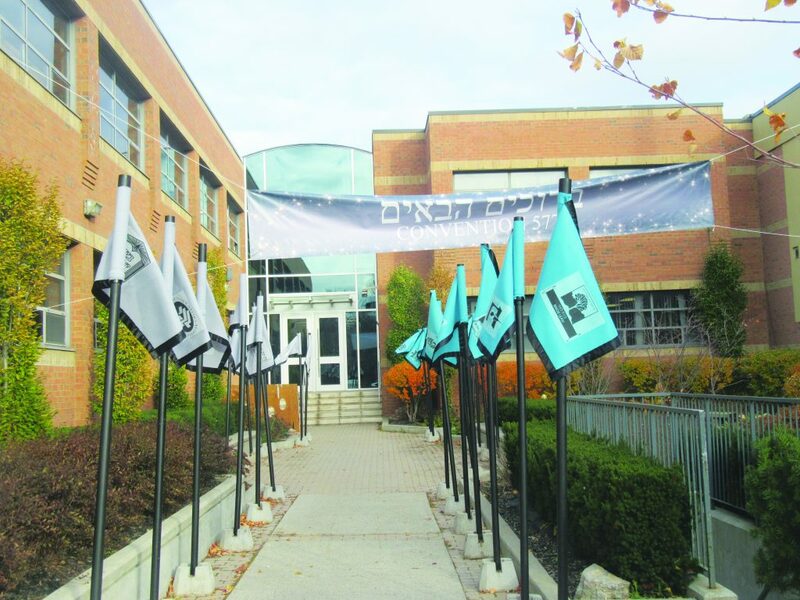 Walkway at Bais Yaakov High School of Toronto, welcoming delegates to the Bais Yaakov Convention. On Shabbos Parashas Toldos, Bais Yaakov High School of Toronto hosted the annual Bais Yaakov Convention, as over 800 girls from 75 schools across the United States and Canada joined together for a Shabbos of simchah, achdus and inspiration. The event was a tremendous success on multiple levels, but, as was expressed by many, perhaps what had the greatest impact was seeing so many Bais Yaakov girls gathered together. “It was amazing to see so many girls gathered together, all from Bais Yaakov, all working towards the same goal,” said Miss Shoshana Lieder from Bais Yaakov High School of Baltimore. However, for Bais Yaakov of Toronto, the host school, the valuable lessons of the convention began long before the delegates began to arrive on Thursday afternoon. As one organizer of the convention explained, “All of the work of preparing the convention is worthwhile, just to see the transformative effects on our students. They have to work together, learn responsibility, respect, and problem-solving. The achdus and camaraderie that was developed cannot be described. The 500 delegates from out of town were graciously hosted by Toronto community members, who treated the girls with warmth, grace, and exemplary hachnasas orchim. Since Toronto last hosted the convention five years ago, 20 new schools have opened up, both in the tri-state area, and in many smaller communities throughout the United States. The mix of schools is very important, as the small schools gain from seeing the vast numbers of the big schools, and the big schools gain inspiration from talking to the girls from the smaller towns. 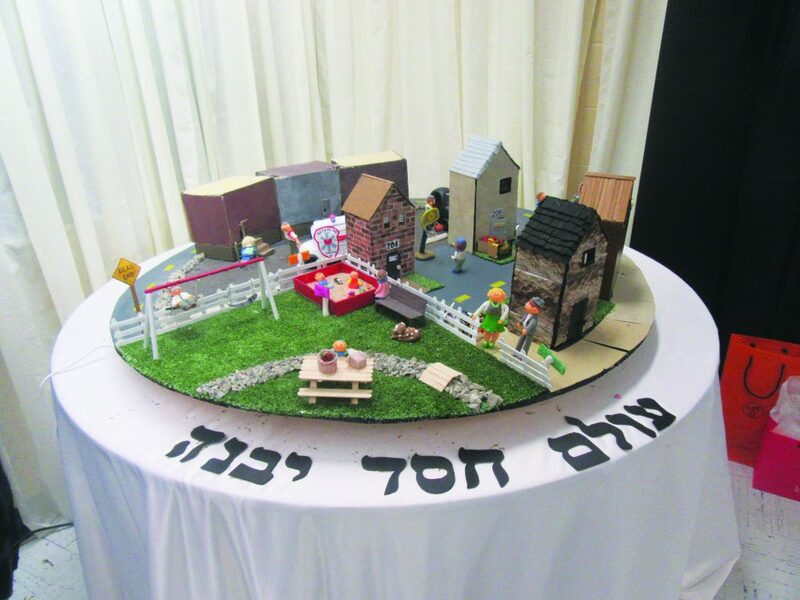 One of the many displays at the Bais Yaakov Convention Exhibit, portraying how chessed builds our world. The theme of the convention was “Ani Yesheinah V’libi Eir — I am asleep, but my heart is awake,” a passuk from Shir Hashirim. One of the main messages of the convention, based on this theme, was although superficially we seem to be sleeping; nevertheless, deep within, there is an inner spark that yearns to connect to Hashem. A multi-faceted and deeply inspiring program was carefully developed for the four days of the convention. Concurrent to the main program, a special program was designed for the principals and chaperons, giving them the opportunity to network and listen to special presentations from renowned mechanchim. The convention opened on Thursday night, with welcoming remarks from Rabbi Moshe Silver, Menahel of Bais Yaakov High School of Toronto. Following the welcoming addresses, the Toronto girls performed the welcoming song, “WOW – Welcome to Our World,” and the convention theme song. Friday included various activities and the opportunity to view the magnificent exhibit, designed by the Toronto students, expounding on various aspects of the convention theme. Shabbos began with an uplifting Kabbalas Shabbos, with the delegates singing together, welcoming the Shabbos. Special addresses were delivered on Shabbos by Rabbi Raphael Gelley, noted educator and lecturer, and Rabbi Yehuda Oppenheimer, Menahel of Bnos Bais Yaakov of Toronto. Motzoei Shabbos began with a heartwarming singing drama, produced by Bais Yaakov of Toronto, followed by a melaveh malkah, featuring a stirring kumzitz and leibedig dancing. Mothers from the community joined in the Motzoei Shabbos program and were treated to a special chinuch panel. On Sunday, the delegates enjoyed a boat ride, and a second exhibit of “A World of Chessed,” featuring various interactive displays on chessed and community chessed organizations, many of which were started by Bais Yaakov alumnae. The closing banquet was an emotional affair, as the girls parted from their newfound friends, and relished the final moments of this very special gathering. Divrei brachah were delivered by Harav Moshe Mordechai Lowy, Rav of of Agudath Israel of Toronto, and Rabbi Gelley. A moving video message was shown by Rabbi Akiva Stefansky, dean and founder of Bais Yaakov High School, who laid the foundation for conventions in Toronto, and defined the framework and purpose of how they should be run. Rabbi Stefansky explained that “Ani yesheinah,” our ambitions in gashmiyus are dormant, but “libi eir,” our ambitions in ruchniyus are alive. One educator reflected on the convention’s success, “If [Frau] Sarah Schenirer or Rebbetzin [Vichna] Kaplan had been there, they would have had tremendous nachas ruach. This was the raison d’etre of the convention — to create a maamad of kiddush Hashem.